When I was a kid we used to get the ice-cream that was 1/3 choc 1/3 vanilla & 1/3 strawberry….I always wondered why the heck they called it ‘Neapolitan’ when it was clearly choc-vanilla-berry. (???) Wikipedia says the name reflects the ‘presumed origin’ of the dessert – Naples, Italy, & it could be any combination of 3 flavours, but the choc-vanilla-berry combo was the US fave when they introduced the fancy desserts over there. Anyway…this smoothie reminds me of that ice-cream, all flavours a bit melted & mixed together! Tip – Use plenty of vanilla, & make sure your berry blend contains some blackberries & strawberries to get that real ‘Neapolitan’ flavour! 4 tbsp of Blend11, soaked overnight. Frozen Banana chunks (1-2 bananas, the more banana you use, the sweeter your smoothie). 1 cup of Frozen mixed berries (works best with blackberry, strawberry, raspberry & blueberry). Scoop or 2 of natural protein powder (whey or a smooth plant protein blend). Cacao powder to taste (if you like it extra chocolatey). Place everything into the blender (soft stuff first), then buzz until really smooth & serve with something to make it look pretty! 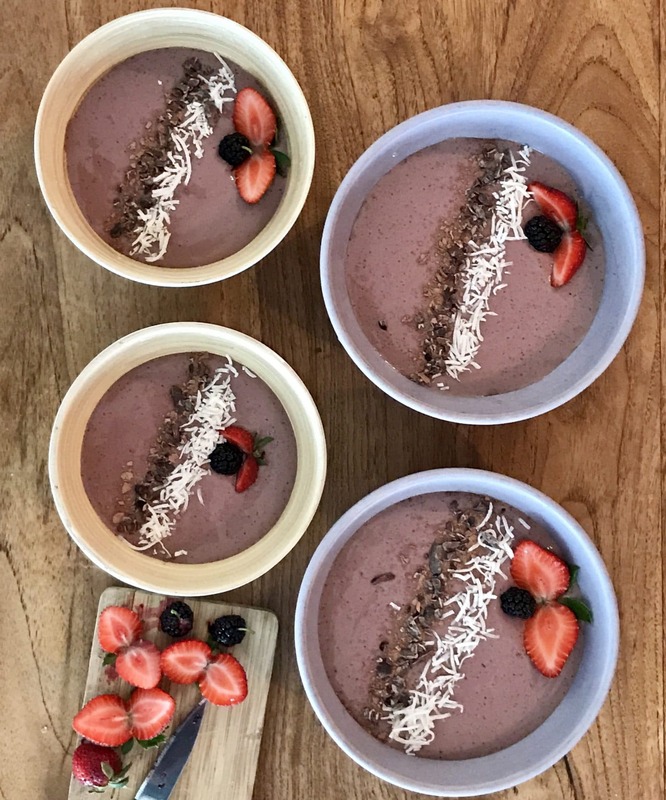 I used shredded coconut plus raw cacao powder & nibs & a few spare berries. You could also leave the Blend11 out of the smoothie & just add it to the top.